It looks like you guys don't just like this idea but you love it!! I'm really excited to announce that we are playing again this year, but I've made some changes. It's a full on summer camp that you might have went to if you were one of those kids lucky enough to go to one of those camps that they always had in the National Lampoon movies. The camp covers 150 acres of wooded hills and valleys with trails running throughout. There are rustic cabins for sleeping in the main camp area. The main lodge features a dinning area with a huge stone hearth and modern kitchen. Crooked Leg Creek provides a natural play area and lulls campers to sleep at night. 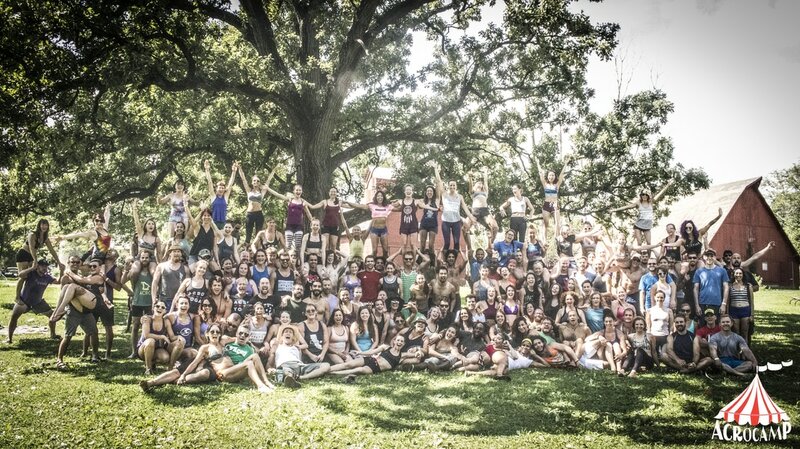 Everything else you know and love about AcroCamp will be the same as it ever was. We're a community built by and supported by you. It's a place to see old friends and make new ones. It's a place to share what you might have to teach, to learn along the way and most importantly to create, play, and explore what it means to be an acroyogi, an acrobat, a creative soul, and a human in community with others. If you are selling your ticket to another participant you will be required to pay an administrative processing fee. We have a lodging option this year!!! There are ten twelve person rustic cabins available to rent. Each cabin has six bunk beds with mattresses. You will have to provide your own bedding whether you want sheets, pillow and a blanket or simply a sleeping bag. You can rent the entire cabin and choose your tent mates or simply rent one bed and be assigned a cabin as you check in on a first come first placed basis. Arrive the afternoon of Thursday the 3rd or Friday the 4th; set up, jam and meet new people. Checkout time is 4PM on the 6th. You must check in before 9PM on Thursday or Friday or you will not be admitted to the property until 8AM on following day. Singing, dancing, spoken word, music, spinning fire… acro maybe?? Whatever it is that you do I’d love to put you on the schedule for Saturday evening and let you show it off. All activities will be held outside. We have very limited indoor spaces available. We are a rain or shine event.